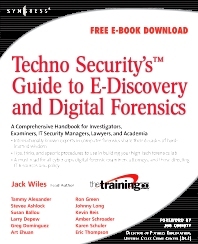 TechnoSecurity's Guide to E-Discovery and Digital Forensics provides IT security professionals with the information (hardware, software, and procedural requirements) needed to create, manage and sustain a digital forensics lab and investigative team that can accurately and effectively analyze forensic data and recover digital evidence, while preserving the integrity of the electronic evidence for discovery and trial. Jack Wiles is a security professional with over 40 years' experience in security-related fields. This includes computer security, disaster recovery, and physical security. He is a professional speaker, and has trained federal agents, corporate attorneys, and internal auditors on a number of computer crime-related topics. He is a pioneer in presenting on a number of subjects, which are now being labeled "Homeland Security" topics. Well over 10,000 people have attended one or more of his presentations since 1988. Jack is also a co-founder and President of TheTrainingCo., and is in frequent contact with members of many state and local law enforcement agencies as well as Special Agents with the U.S. Secret Service, FBI, IRS-CID, U.S. Customs, Department of Justice, The Department of Defense, and numerous members of High-Tech Crime units. He was also appointed as the first President of the North Carolina InfraGard chapter, which is now one of the largest chapters in the country. He is also a founding member of the U.S. Secret Service South Carolina Electronic Crimes Task Force. Jack is also a Vietnam veteran who served with the 101st Airborne Division in Vietnam in 1967-68, where he was awarded two Bronze stars for his actions in combat. He recently retired from the U.S. Army Reserves as a lieutenant colonel and was assigned directly to the Pentagon for the final seven years of his career.